Musical Fidelity's Antony Michaelson is a huge fan of headphones and regularly uses them at home for critical/recreational listening. Hence, the company's legacy of high-quality headphone amplifiers in its product line up. The Musical Fidelity M1 HPA is totally straightforward. It has sockets for two sets of headphones, plus inputs for line/ USB and a volume control. There's also an output via RCA phono sockets, enabling the device to be used as a preamp – but more on this later. 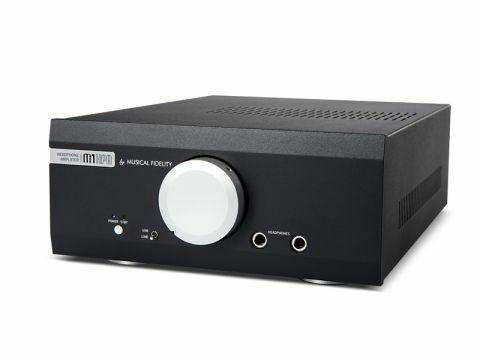 In effect, the M1 HPA is a miniature Pure Class A power amp. It is designed to handle complex loads and has a low output impedance. Some of the best headphones present quite a challenge to drive, but the M1 HPA should handle even the most difficult. The device is beautifully finished and very solidly made, looking and feeling far more expensive than it is. The all-metal casework has a classy, understated appearance and the controls operate smoothly and crisply. Headphone listening is a very personal thing – not everyone enjoys the experience. However, it's still fair to say that – with a dedicated amplifier of HPA-calibre and a good set of headphones – superb results can be achieved at a very reasonable price. Compared to the quality of sound you might get from a typical amplifier (with its headphone socket padded down from the speaker output), the M1 HPA sounds cleaner and more purposeful, with greater immediacy and a wider dynamic range. Bass is firm, clean, and very deep and powerful. Tonally, the results are crisp and very detailed. Even with inefficient headphones, the HPA has power to spare and can produce fairly high sound-pressure levels. Being Pure Class A with low output impedance (less than one ohm), it's able to drive even difficult 'phones (like the AKG 1000) with ease. And, as mentioned, it has ample gain – with some 'phones, enough to cause hearing damage – so take care! As if being a brilliant headphone amp wasn't enough, the HPA has another trick up its sleeve; it can double as a high-quality line-level preamp. There's an extra set of phono socket outputs on the back for users wanting to go down this route. Agreed, as a preamp the HPA has some restrictions – you've just the one pair of line inputs, for example, but, for those on a tight budget wanting a world-class line preamp, the HPA's functional limitations are worth putting up with. As a preamp, the device sounds very clean and focussed, with good detail and wide dynamic range. Tonally, the presentation is a touch dry and lean, rather than rich, warm, or euphonic, but clarity is excellent. For anyone serious about headphones, Musical Fidelity's M1 HPA is well worth a listen. By audiophile standards, it's an incredibly well-priced, high-quality piece of kit that offers outstandingly good results in a small neat package. Choose your headphones wisely, and you'll have a package that rivals the sonic performance of large ultraexpensive loudspeakers and amplifiers. The HPA also doubles as a superb line-level preamp. Indeed, you might have to pay five times the HPA's asking price to significantly better its performance here. If that isn't value, we don't know what is!